Will this show continue to be a “Goliath” in the ratings? Is the Survivor TV show cancelled or renewed for a 38th season on CBS? The television vulture is watching all the latest TV cancellation and renewal news, so this page is the place to track the status of Survivor, season 38. Bookmark it, or subscribe for the latest updates. Remember, the television vulture is watching your shows. Are you? 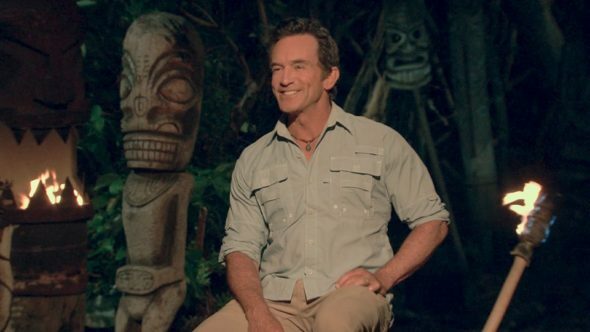 A CBS competition series, Survivor is hosted by Jeff Probst and features a group of castaways who try to outwit, outlast, and outplay each other. One’s ultimate goal is to hang on until the very end and hope that he/she will be named the sole survivor and will win the $1,000,000 prize money. In cycle 37, the 20 contestants are relocated to Fiji (the show’s sixth time there) and are separated into two teams that represent underdogs and top dogs — “David” and “Goliath”. The David tribe is made up of Christian Hubicki, Nick Wilson, Davie Rickenbacker, Pat Cusack, Carl Boudreaux, Jessica Peet, Elizabeth Olson, Gabby Pascuzzi, Lyrsa Torres, and Bi Nguyen. The Goliath tribe is John Hennigan, Alec Merlino, Jeremy Crawford, Dan Rengering, Mike White, Natalia Azoqa, Angelina Keeley, Kara Kay, Alison Raybould, and Natalie Cole. The 37th season of Survivor averaged a 1.47 rating in the 18-49 demographic and 7.32 million viewers. Compared to season 35 (Fall 2017), that’s down by 12% in the demo and down by 10% in viewership. Find out how Survivor stacks up against the other CBS TV shows. Survivor has already been renewed for a 38th season which will debut February 20, 2019. Stay tuned for further updates. We already know that Survivor has been renewed for a 38th cycle for Spring 2019. Still, the show’s ratings impact the series’ future beyond that. I’ll keep an eye on the Nielsens and update this page with breaking developments. Subscribe for free Survivor cancellation or renewal alerts. TV show ratings are still important. Follow Survivor‘s weekly ups and downs. Find more Survivor TV series news or other CBS TV show news. What do you think? Do you like Survivor TV series on CBS? Should it have been cancelled instead of renewed for a 38th season? Survivor: Cancelled or Renewed for Season 36 on CBS?